Fabrics and haberdasheries at the largest online shop. Buy now! Need more meters? Watch the video. Buy Jersey Cotton Fabric Digital panther print online. Product code: R171620 Quality: 92% Cotton..
Quality: 95% Cotton 5% Elastan Width: 70 cm (Circular 35cm) Weight: 550 grams/m2 Product code: ..
Buy terry fabric petrol by the meter. Product code: R904427 Quality: Cotton Width: 150 cm Weig..
Buy Waffle Pique Fabric Old Pink by the meter online. Product code: R477728 Quality: Cotton Wid..
Buy Viscose Jersey Coral Pink online by the meter at Rijs Textiles. Product code: R478031 Qualit..
Buy Double Gauze Fabric Light Grey by the meter online. Product code: R436608 Quality: 100% Cott..
Quality: 80% Cotton 20% Polyester Width: 150 cm Weight: 300 grams/m2 Product code: 572025 ..
Buy elastic edging ribbon white 17mm per meter cheap online. Product code: eledg010 Quality: 70%..
Buy cotton cord red 3mm (per meter) cheap online. Product code: cord007 Quality: Cotton Thickne..
Quality: 57% Polyester 43% Polyurethane Width: 20 mm Product code: LEDB001 ..
Buy flat cotton cord navy 12mm wide cheap online. Product code: flatco002 Quality: Cotton Width..
Quality: Cotton Width: 15 mm Product code: KANT010 ..
Quality: 57% Polyester 43% Gummi Width: 40 mm Product code: ELTAPE011 ..
Quality: 57% Polyester 43% Gummi Width: 18 mm Product code: ELBAND18W ..
Buy overlock thread package 25 colors x 10 pieces cheap online. Product code: lock250pak Quality..
Buy polypropylene webbing white 40mm (per meter) online. Product code: tas40mm010 Quality: Polyp.. Fabrics, yarn, haberdashery... There's a lot necessary for self-made fashion and clothing production. Rijs Textiles is the address for everyone who makes clothing, from hobbyist to professional designers and companies. Every week we add new fabrics and accessories to our web shop, so you can find everything you need there. From bands and needles to threads and zippers. And of course the most beautiful fabrics for low prices. These are the reasons that even fabric stores from the Netherlands and abroad do their purchasing with us. Rijs Textiles offers an enormous assortment of textiles. Just to name a few: sweat fabrics, jersey fabrics, cotton jersey, fabrics for children and knitted cuffs fabrics. Whether you're looking for plain fabrics or the most beautiful patterns, in our collection you can find everything from classic gingham plaid cotton to tough and sturdy jute. Located in the textiles city of Tilburg, we can rely on more than 50 years of experience in our trade. This is why we know everything -from the needle to the thread- about fabrics and all that comes with them. Customer friendliness is very important to us. To prove this, we have made our order process as flexible as possible. You can order coupons and pieces of fabric from as little as 50 centimeters with us. If you need more than 6 meters, our wholesale department will help you. And this comes with a nice discount. Looking for that one perfect pattern, a special fabric or colorful sequins? You can stop searching and find it all in our shop. You can find all haberdashery that you need at Rijs Textiles. And when we say all haberdashery we really mean everything! Zippers, Gütermann threads, Schmetz needles, webbing, biais band, cord, lace band, elastic band and haberdashery accessories... Since recently we also have crochet yarn and knitting wool in our web shop, of course only the best quality. Apart from our extensive collection, which consists of more than 10,000 beautiful fabrics and haberdashery, Rijs Textiles is different than the rest because of our low prices. For many customers our value packages are extra appealing. These include surprising fabrics and haberdashery preselected by us. They are, for example, perfect for clothing designers when compiling a sample collection. 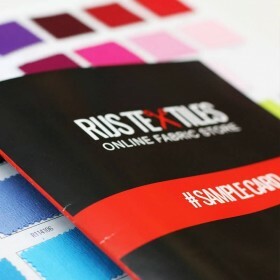 Even if you need fabrics for other purposes than clothing, Rijs Textiles is the place to be. Apart from fashion fabrics we also offer other decorative fabrics and dance fabrics like lycra, tulle, leather, felt and beanbag fabrics. Reliability, fast delivery and flexibility form the foundation of our work. We realize that buying fabrics online may be difficult, because you can't feel and see the fabric from up close. So don't hesitate to add fabric samples to your order. And by following us on Facebook, Twitter, YouTube, Pinterest or Google+ you are always informed of the newest and most surprising fabrics, haberdashery and trends!